I’ll admit that this collection was very inciting but a bit pricey even with a $2 off coupon. I bought this one above all others because I’ve been wanting a silver shard glitter. The dark grey polish that came with this is an easy one coat I did two I’m sure. The glitter base is a little thick but surprisingly even coverage. 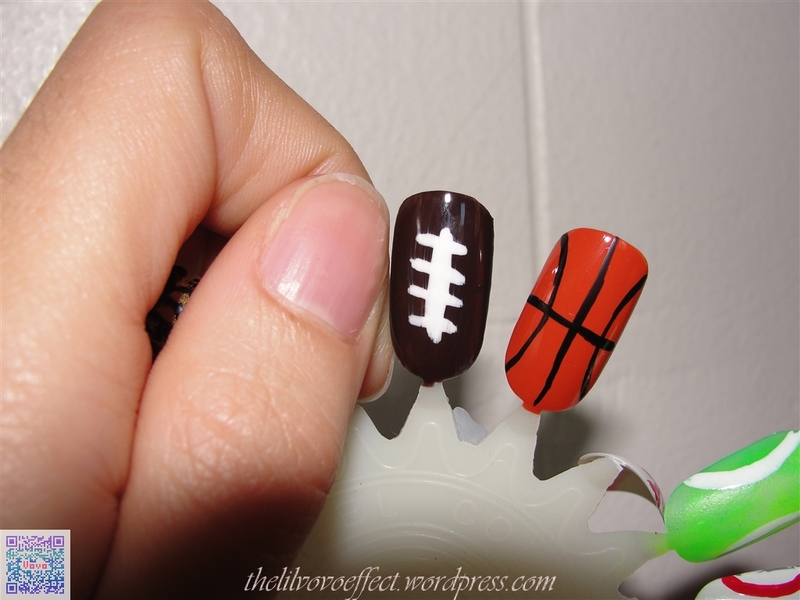 Two coats on the ring finger. A little chunky. I like this quite a bit! What are your thoughts? Don’t you hate when you forget to clean your screen on your laptop and you’re sitting there thinking, “What is on her face?! Oh wait…” Let that be a lesson kids don’t surf and eat…. 😛 Haha. Well this next polish is super interesting! 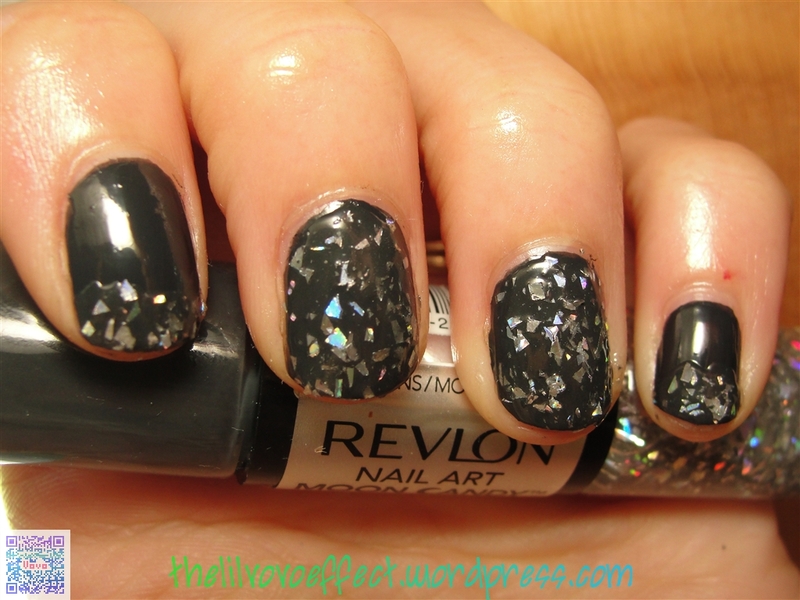 Revlon French Roast 3 coats one top coat, is a creme brown with a glass fleck in it that shows a rainbow of colors. Just look at it! I think the name it very fitting to me it looks like a bag of coffee beans. This is from the Colorstay core line and I was actually going to get a different color until I saw this! I was like…meh…brown…wait…WHHHHHHAAaaAATTTTT?!?!?! O.O This is very smooth and no problemos with it. I will have fun with it more this fall I think. Like I said before- I don’t really go by season much as to what colors I wear- it’s just that there are so many fun neons I need to wear right now I wont be able to try this again until fall haha. Hello! Now remember how I said that my camera seems to have issue’s with purple polish? This is one of them but not as bad as the Milani. This doesn’t look completely different from picture to picture. It just seems to be a little less purple then I thought it was. Also, I feel like I should mention that this is my first scented polish. 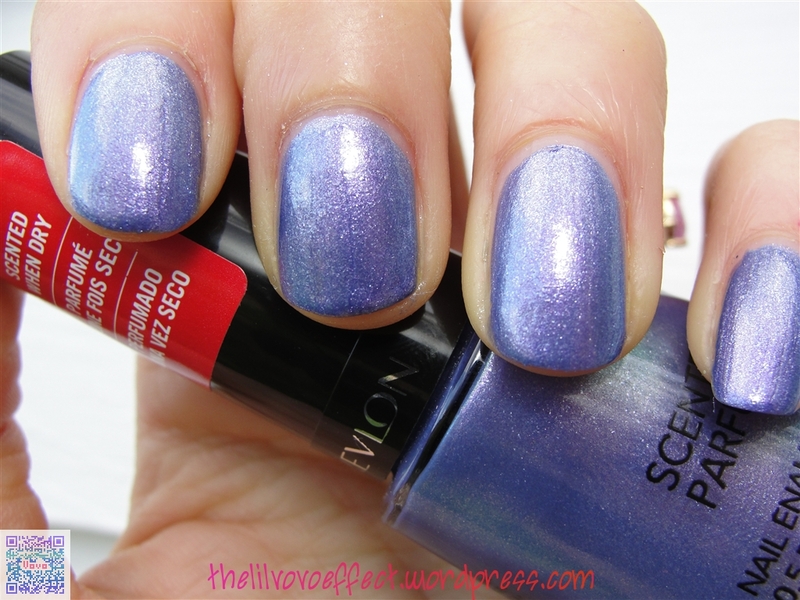 Revlon “Not So Blueberry” is in 3 coats here. Not very sheer but not opaque in one coat, builds up nicely and I would even say that the formula is perfect. Just my opinion. This seems to be glass flecked. In the bottle it almost looks like a duo chrome sort of color with a blue and purple, but its barely noticeable on the nail. you can almost see it in the 2nd pic. Either way I’m not too disappointed by that I love this color. So you all probably know this but there isn’t a scent until this polish dries. The smell of NSB really reminds me of a blue dum dum pop. I’m thinking it’s more like the blue raspberry. I didn’t do a top coat in these picture but I did wear this again and with a top coat and I could still smell them. It wasn’t still a bit “smelly” for a few days, probably could have went longer but I took it off for more swatching. I almost wish this wasn’t scented because its not over whelming but a little weird when you’re eating something (pizza for example) and its conflicting with the smell what you’re eating. Pepperoni blu raspberry, anyone? So in conclusion, scented polishes are fun but I wouldn’t buy them for the smell. The other scented Revlon I wan’t is “Beach”, a really pretty green that leans towards yellow. I expect that will smell a lot less fruity. Hello! If you missed part 1 click here! I’m not going to say anything else about Pirouette My Whistle (PMW) because it’s all in part 1. But I will say that I love it and I will be using it again in a post, who knows when though? So here’s the right hand! PMW is 2 coasts on all nails with Sally Hansen Intsa Dri Topcoat. Sorry about the middle finger I was already beyond frustrated to fix it! Kleancolor Melon Green is 3 coats. Kind of frosty builds nicely. Revlon Minted is in 3 coats. This is another polish that likes to bald badly. So I ended up putting the last coat thick. So apparently while picturing the left hand first I must have pressed it to hard into the camera. I was pretty sure it was dry and since I already had to monkey with it just to get it on the nail in the first place I didn’t want to go through another headache to fix it. Pretty much the same as SC Unicorn on the middle finger, left hand. 3 coats of SC Nirvana. It seems like a few of the SC’s like to bald and never dry. This one isn’t as bad as Unicorn but you have to carefully lay it on thick. 3 coats of SC Ruby Ruby. I pretty good formula especially compared to the majority of the other SC’s I used for this swatching. I hope you enjoyed the swatches of PMW. Hey there! Here’s another picture from when I had that ugly hangnail! I should have add that to my rant last week XD. Anyways I just had to point that out because it bother’s me that I spent so much time doing swatches and never noticed it until I looked at the pictures on my computer. So do you own Whimsical? Love it? Hate it? Don’t be shy! Share your thoughts!